Set up an Office 365 developer subscription to build your solutions independent of your production environment. The subscription is an Office 365 Enterprise E3 Developer subscription with 25 user licenses. It lasts for 90 days and is free to use for development purposes (coding solutions). To set up a subscription, you must first join the Office 365 Developer Program. After joining, you'll see the option to set up a subscription. To get an Office 365 developer subscription, on your profile page, under Need an Office 365 subscription to use for development?, choose Set up subscription. In the Set up your developer subscription dialog box, create a username and domain. This account will have global administrator permissions for the subscription. You can choose any username or domain name as long as it is not already in use. Do not use spaces. If you are asked to prove that you're not a robot, follow the instructions, and then choose Verify. After the subscription is created, your subscription name and expiration date appear on your profile page. Make a note of your username and password because you'll need it to access your developer subscription. On your profile page, choose the office.com link and sign in with your user ID (for example, username@domain.onmicrosoft.com) and the password that you specified for your developer subscription. Do not sign in to your subscription with your developer program credentials. Use the app launcher to go to the Admin center. On the Admin center home page, choose Go to setup. This takes you to the Office 365 Enterprise E3 Developer Setup page. Personalize your sign-in and email. You can connect your subscription to a domain, or just use the existing subdomain that you created. When ready, choose Next. Add new users. You can add users. These could be fictional users, or real users helping you with development. When ready, choose Next. If you need to bulk-add users, you can do this later. For more information, see Add users individually or in bulk to Office 365 - Admin Help. Assign licenses to unlicensed users. For any users that you want to be able to work with the subscription, grant them a license. When ready, choose Next. Share sign-in credentials. For any real users that will access the subscription, you must share their sign-in credentials with them. You can choose a method, such as email, download, or print. When ready, choose Next. 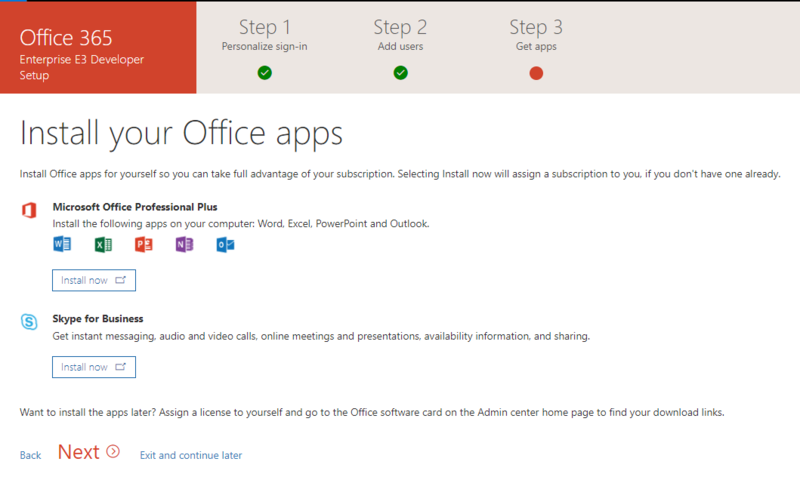 Install your Office apps. You have the option of installing Office apps to your computer. When ready, choose Next. On subsequent visits to the Dashboard, sign in with your *username@domain*.onmicrosoft.com account before you go to the Dashboard. You've reached the end of setup. You've completed the setup for your subscription. You can optionally rate the experience. When ready, choose Go to the Admin center. At this time, the subscription's region defaults to North America regardless of which country/region you are in. You can still proceed with setting up and using your developer subscription. It will take some time for the backend services, such as SharePoint and Exchange, to provision for the subscription. During this step, some of the icons in the app launcher and on the Home page show as Setting up (This app is still being set up). This will take no longer than an hour. When the provisioning is complete, you can use the new Office 365 subscription for development. The subscription expires after 90 days. To extend it, see When my subscription is about to expire, can I extend it?. We also recommend that you enable release options to ensure that you get access to the latest Office 365 features as soon as possible. For more information, see Set up the Standard or Targeted release options in Office 365. For some Office solutions, you might need a Microsoft Azure account to build using Azure services. To set up a free Azure account, see Create your Azure free account today. If you decide that you no longer want to participate in the Office 365 Developer Program, you can end your subscription and leave the program. The following steps will erase all of your profile information. You will lose any data stored in your developer subscription that is not backed up elsewhere. Sign in to the Office 365 Developer Program. In the Delete Profile confirmation box, choose Delete.